As you may know, I run a 1500 slot Mumble server off of a DreamHost VPS. You may be thinking "why the hell is he doing that?" well, Murmur is so light-weight that it takes almost nothing to run, at this exact moment I have 49 people in mine and I can't even measure the resource use, its that low. So why use a DreamHost VPS? Well for $15 a month you can run a 1500 slot mumble without ever going over the resource limit, thats why; so lets get started, shall we? Note: This install guide can be applied to just about any Linux VPS. After creating the user we need to open up PuTTY and your favorite FTP program connecting with the user we created above. From here we will go on to use wget to download murmur, and install. Type the following in putty to create the directory that will house the backend. We can proceed to use wget to download murmur now, so lets do it. Now we have Murmur downloaded and un-tarred, so all we need to do from here is make sure it un-tarred correctly, lets enter the directory and see if everything is there. All is well if your directory looks like this. Now open up your FTP client (leave putty open) and navigate to the murmur.ini file, the main thing we HAVE to change is the port, at least it was in my case. So find it and change it to this or anything else you like, this is the port users will connect to. From here edit the rest of the config file to your own needs, save it and we can proceed to run murmur for the first time via putty by first setting permission to execute. 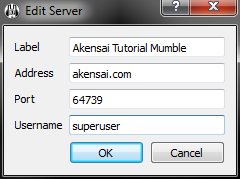 Now we can run murmur with super password! You did it! 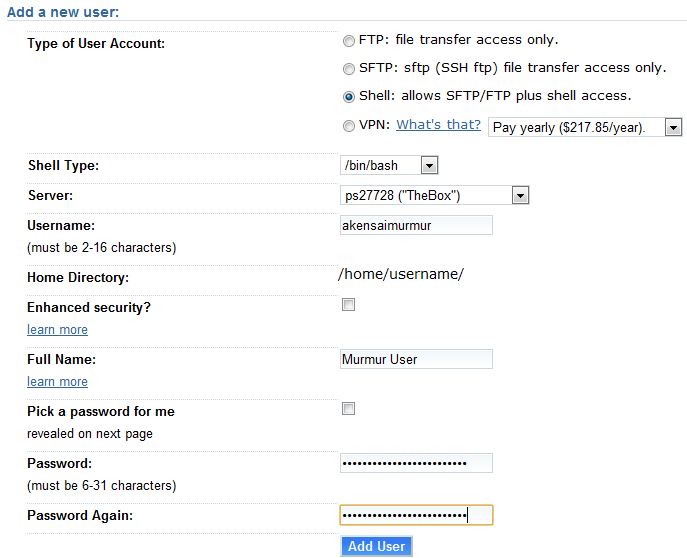 Murmur is now running on your server and waiting for you to login as the superuser. What we need to do now is set your actual name as an admin. Connect to it via the domain name you have setup with your VPS (eg: akensai.com) and the port you set in the ini file. When you enter the information set your user name as "superuser" and when it asks for the password enter the one you set with putty. Now you can reconnect with your REAL username. 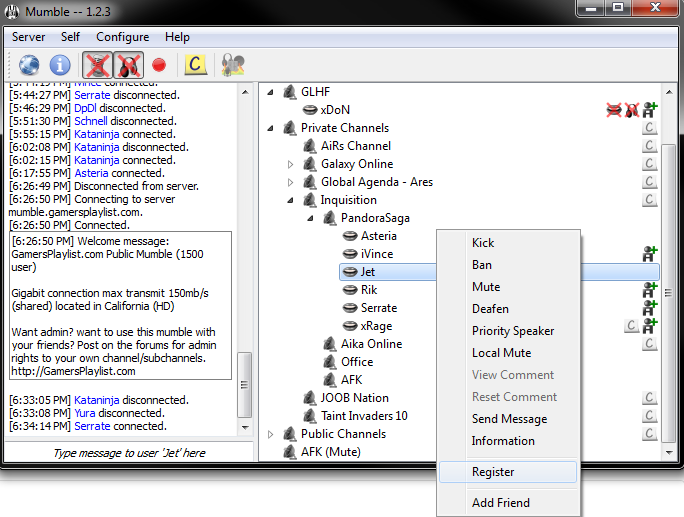 Right click your name is the channel list and than click "Register". Register your user (example I used since I'm already registered). Go back and reconnect as superuser. Right click the root channel and edit, go to groups and select admin from the drop-down list and type in your own name at the bottom left. 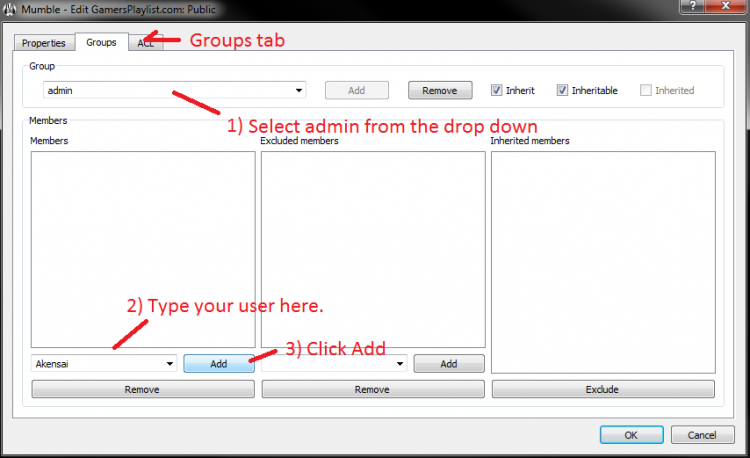 Set your user as admin. Connect one last time with the name you just gave admin to and enjoy! Have fun guys, and remember this is totally allowed on a DreamHost VPS, but if you run it on shared hosting you're probably going to get into a bit of trouble.